Before Georg Everhard Rumphius (1627/8-1702) joined the Dutch East India Company in 1652, he had, among other things, already been a prisoner of war in Portugal for a period of time. With the 'Loffelijke Compagnie' (Honorable Company) he was first a soldier, and afterwards he was stationed as a merchant on the island of Amboina, in which function he gave great satisfaction to his superiors. Rumphius fell in love with the island so deeply that he decided to make an extensive description of it. He completed a volume on the flora: Het Amboinsch kruid-boek (The Amboina book of herbs) and one on marine life: D'Amboinsche rariteitkamer (The Amboina collection of curiosities). These are beautiful books in many respects, which rightly earned Rumphius the epithet of 'de Indische Plinius' (the East-Indian Pliny), and our admiration for them is increased even more when we know that in 1670 he was struck by the worst disaster that may befall a natural scientist: blindness. Although he had become useless to the Company, they still kept him in paid service and even provided him with a clerk and a copyist, so that Rumphius together with his son Paulus Augustus could continue his life's work. In this he was not spared further calamities: in 1687 his house was destroyed, in which his wife and two of his children perished and the larger part of his material was lost. Fortunately the lost part could be reconstructed, but all would have been lost for ever in the transport from Java to Holland, when the ship containing its precious cargo was sunk by the French, if the governor-general of the East Indies, Joannes Camphuis, had not had Rumphius' manuscript copied first, as a wise precaution. The manuscripts with Rumphius’ work on the Amboina flora were kept in the archives of the Dutch East India Company. Professor Joannes Burman published them in 1741-1750, and eventually they ended up in the possession of Leiden University Library, just as the series which at first remained behind on Java (BPL 311-313). Experience has indeed taught us that the descriptions by Rumphius are extremely valuable, not least because on the whole Rumphius also paid attention to the environment of the flora and fauna. The same is true for the illustrations. 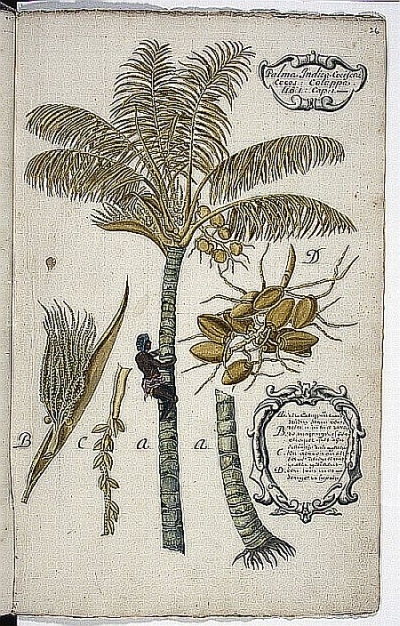 The depicted tree is the Cocos nucifera L.
Blog post based on a catalogue entry in R. Breugelmans (ed. ), Goed gezien. Tien eeuwen wetenschap in handschrift en druk. Leiden 1987.